Two of a kind: The First Tactical Ascend Messenger Bag (Left) and the First Tactical Summit Side Satchel (Right). 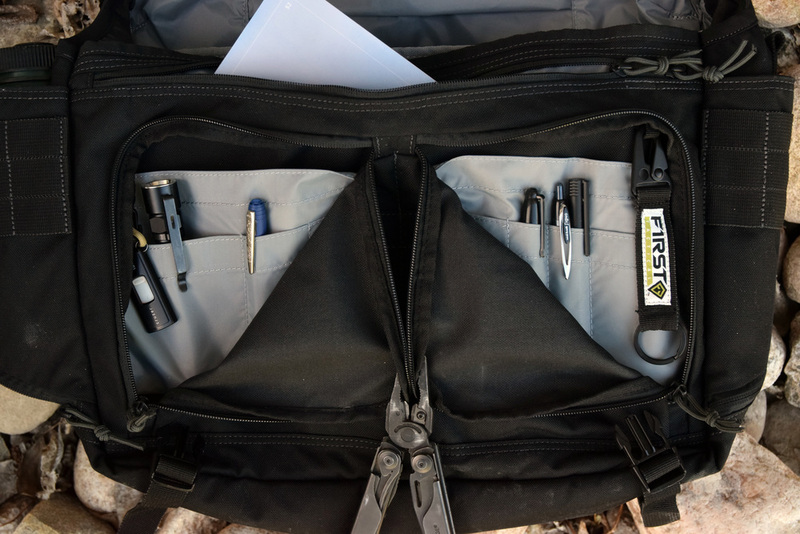 Many of you may recall the review of the First Tactical Summit Side Satchel (You can find it here) that I wrote a couple of months ago. That bag is a great model and has become my dedicated camera bag with the addition of an Ape Case insert. Being such a small bag, it limits the capacity at times though. The First Tactical Ascend Messenger Bag is that bags big brother, and it bears a strong family resemblance. While the Summit was designed for minimalist and quick tasks, the Ascend is designed to haul everything one might need for a full day or maybe more. In many ways, it is simply a scaled up Summit; in some other ways, it shows useful upgrades over the the Summit. This is a larger messenger bag intended to carry a full days loadout. I was interested in it to carry my laptop, compact DSLR, bible, Glock 23 and a small EDC load out. Here you can see what the bag looks like from the front. It has 3 externally accessible pockets. The top pocket is built into the flap and is fleece lined. The other two pockets are a pair of slash pocket that cover most of the flap. These are both billowed slightly. Also on the front of the bag is a small loop field for patches that overlays a 5x3 PALS grid. From this shot you can also see that the female buckles designed to hold the flap down are wrapped in elastic webbing. The female buckles can be pulled out of the elastic coverage if so desired. This shot allows you to see what is going on at the rear of the bag. The carry handle sits atop the bag. The main feature at the rear of the bag is the CCW pocket. Many CCW pockets are simply a large slash pocket lined with loop material to allow the attachment of a hook backed holster. The Ascend Messenger has a similar slash pocket that has a zipper closure that covers the entirety of the bags footprint from the rear. The zippers are designed in such a way that it can be opened from either side by pulling a single pull. However, First Tactical has opted to improve upon this design by adding an additional divider within the slash pocket. The divider is padded to help prevent the patterning of your sidearm, has been lined with loop material on the interior side for holster mounting and has a simple hook and loop closure at the top that secures it to the main side of the bag (that's a Glock 23 mounted in there). The exterior side of the divider bears no additional features that would distinguish it from a normal slash pocket. There are two tabs near the bottom rear corners of the bag. These are here to attach the included stabilizer strap. On the Ascend, First Tactical added a low profile strip of webbing to allow the bag to ride atop rolling luggage. The strap pad is also visible in this shot. It has two portions that are rubberized and tacky to provide traction on the users shoulder. The pad is thick and lined with mesh to provide ventilation and comfort during extended use. Each side has a basic 3x3 PALS grid for attachment of additional pouches. Behind the PALS grid on each side is a very clever zipper out bottle pouch. When collapsed, these pouches are hardly noticeable, but when expanded, they will hold a 32oz Nalgene bottle without issue. The attachment points for the shoulder strap are here. They are angled back at a natural angle for the shoulder strap to wrap around the users body. Under the flap the user is able to see a number of features. In addition to the straps and buckles that secures the flap, the user has the option to secure the flap via hook and loop. First Tactical has included a clever way to stow a coverage for the hook side of the closure should the user opt to use the straps and buckles only. There is a large ID patch on the underside of the flap to allow the user to mark the bag. Also visible in this shot are two open top slash pockets that sit atop the admin pockets (described below). One additional feature on the Ascend versus the Summit is a full width zippered slip pocket that holds a magazine or a thin notebook perfectly. First Tactical has included what I will refer to as the “Admin Pockets.” There are a total of two separate admin pockets that are under the open top slash pockets seen above. These pockets have a two sided zipper to allow access to the interior. Each pocket has a selection of slots and pockets within for common admin items. One has a clasp to hook a lanyard or key ring to, and the other contains a small loop with a removable key fob attached. The two admin pockets are completely separated from each other. The interior main pocket of the bag has a total of 6 smaller pockets within it. At the rear of the bag is a padded laptop sleeve that can be secured with a simple strap over the top. On the other side of this pocket are two smaller padded pockets that appear to be big enough for something about the side of an iPad (I have sold mine since reviewing the Summit; sorry I cannot verify fit!). These three pockets are flat pockets with no depth built into them. On top of these there is a 4” tall swath of loop material and a 2” wide piece of webbing with 1.5” wide columns sewn into it to allow mounting of either hook backed or PALS pouches. Opposite these three pockets are three basic open top pockets with some depth built into them. These lay flat when empty. This bag has many features that are quite well done. It shares many of the same benefits as it’s little brother, the Summit Side Satchel. Like the Summit, the Ascend Messenger bag is well made from quality components. Durability should not be an issue with this piece. The exterior front flap pockets are all very useful. Most messenger bags fail to include a sun glass pocket, and the large slash pockets are great for dropping items such as keys into. The use of the elastic webbing to secure the female closure buckles makes them much easier to articulate one handed. This is a great feature on both of the First Tactical messenger bags. The addition of the padded divider to the CCW pocket makes it easy to conceal a side arm and allows the user to use the exterior portion of that pocket for other small items, while keeping the firearm from view. The way the zipper pulls are situated on this pocket allow opening from either side under any circumstance. All CCW pockets should be this fool-proof. The carry handle is well designed. It is sufficiently stiff to allow easy grabbing, while the design is low profile enough to avoid common snags. It is both comfortable and convenient. The optional use of hook and loop to secure the bags flap is the best design I have seen. The built in hook covers are quite clever and very well executed. The sizing of this bag will lend itself to carriage of much more standard messenger bag items (textbooks, a laptop, etc) than that of the Summit Side Satchel. Some users will appreciate the gains in space. There are however a few concerns with the design. The strap is too short. I am 5’10” and 200lbs and have the strap maxed out in length. Several additional inches in length would be necessary for larger users. The admin pockets are not overly well designed. The two sided zipper design fails to allow the user complete access to the pockets and inhibits the ease with which the user can stow or remove items from them. The key fob is a nice touch, but the loop it mounts to is so far recessed that it is difficult to attach or remove the fob from (notice that you cannot see the mounting loop in the photo above). The way the laptop/tablet sleeve is situated on the same wall of the bags as the CCW pocket is troublesome. Because the CCW pocket has no depth built into it and the laptop sleeve has only minimal depth, they push into the usable space of the other. On the smaller Summit Side Satchel, it seems the user can opt to use only one of these features at a time. This problem is somewhat mitigated on the Ascend Messenger because the bag is just physically bigger. I can mount my Glock 23 and carry a laptop without too much trouble, but they do conflict with each other for space in the bag and give the rear of the bag an unnatural bulge. Designs of CCW pockets need to integrate some depth into these compartments for better carriage of side arms. I have determined that this bag is really too big for my uses. It is simply too easy to load it up with camera gear, a laptop and 1 liter of water and sling it over one shoulder. As I’ve worked with this bag, I’ve realized that it is simply too large for single shoulder carry when loaded up to it’s capacity. I realize this is a philosophy of use issue and that will change with the user. I would love to see First Tactical offer a variant messenger bag sized precisely in between this and the Summit Side Satchel. The Ascend Messenger is a quality piece that includes many excellent design features. Aside from the issues I described above, I'd happily recommend it for those who need a bag in this size and style class. For more info on this bag, please visit the First Tactical Website. Disclaimer: First Tactical provided this bag in exchange for my unbiased review.